Sirona’s Cerec ceramic milling system is one of the most coveted systems in both dental laboratories and dental operatories across the globe. This system has become so popular that if you were to ask any dentist in the world to name the top 3 milling systems, Cerec would most definitely be on their list. But with all of the notoriety that the Cerec system carries, and as with all CAD/CAM and traditionally fabricated restorations, there is a constant need for various types of adjustments to ensure proper fitting of the restoration. 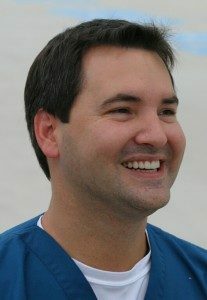 While many other companies offer inefficient paint on or spray on glazing techniques to re-seal and re-polish CAD/CAM generated restorations, such as Cerec or pressed and porcelain fused to metal types, they seem to appear to provide a surface smoothness that is safe for the opposing dentition but don’t seem to offer a long term solution. There have been two recent studies exposing the quickest and most effective method of re-polishing a Cerec restoration. Both offer a final result that is easy to accomplish and extremely safe for the patient. It was reported that the polish used in the Boston University study was Dental Ventures Zircon-Brite. The second, a study conducted in Kobe, Japan, showed that polishing adjusted areas on Cerec zirconia restorations using Zircon-Brite with a soft bristle brush reduced surface roughness DRASTICALLY in no more than 15 seconds of polishing time. All while providing a safe, non-damaging surface smoothness. Zircon-Brite, the polishing product reportedly used in both studies offers advantages outside of re-sealing and re-polishing the adjusted areas of a Cerec type or other restoration. 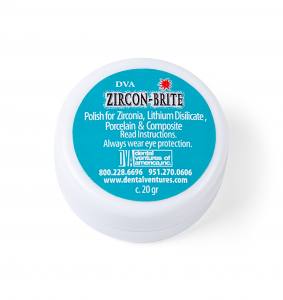 Zircon-Brite has been recognized as the perfect companion to all types of ceramic restorations including Zirconia, Lithium Disilicate and Composites. This product also offers a significant simplification of technique for Cerec type or pressed IPS e.max® users by eliminating the 2nd, 3rd, or 4th glaze cycle that is typically required to complete an IPS e.max® restoration. Zircon-Brite provides ideal surface texture and high shine to under-glazed Lithium Disilicate restorations. Zircon-Brite has also been selected by one of the most prestigious third party evaluators as one of the TOP DENTAL PRODUCTS OF 2010 and recognized as a proven classic of 2011. Zircon-Brite is available in a 20 gram jar designed for laboratory use and a 6 gram syringe for use in chair-side applications. Contact Dental Ventures of America to order or learn more about it’s application and use or click here to order from our web store.